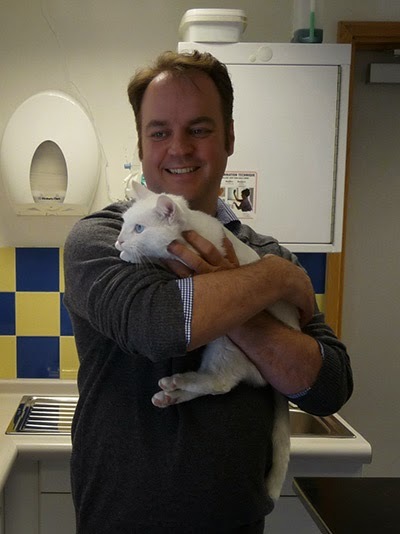 Earlier this week we were very excited to receive a visit from Simon Tofield, creator of Simon’s Cat, at the National Cat Centre in Sussex. Following a successful crowdfunding project, Simon’s Cat raised funding to create an 11 minute colour film, Off to the Vet. 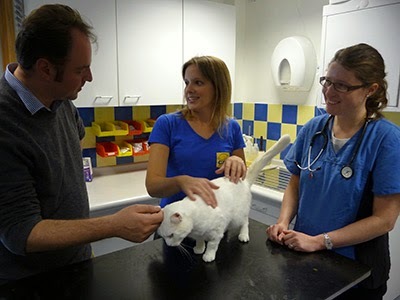 Simon and his colleagues visited us to do some research for the film and to chat to Cats Protection vets about a typical check-up. Off to the Vet will tell the story of how Simon's cat instinctively knows a trip to the vet is imminent and the lengths he'll go to avoid it. For long-suffering Simon, it is a day he dreads as he is forced to try all kinds of tricks to get his cat to co-operate. Simon tries to minimise stress, but fails miserably. That said it's equally stressful for Simon as it is for the cat. 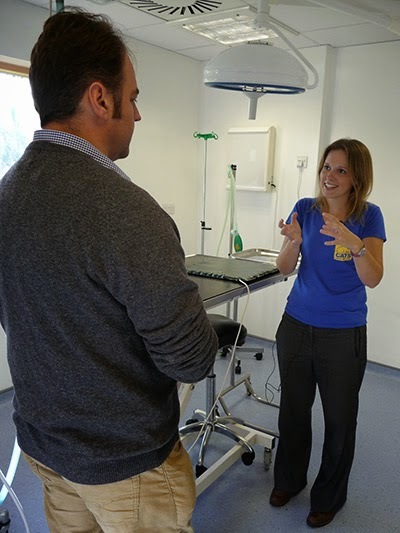 Simon spent some time talking to our Veterinary Officer Emily Billings, who discussed what happens at a general check-up at the vets and how she makes a cat more comfortable during the procedure. There was a very noisy cat in the pen alongside her which you may hear miaowing in the video! Emily showed what she’d do in a typical check-up with Yoda, a beautiful white cat currently in our care. She explained that she’d assess a cat from a distance before checking them over from nose to tail looking for any signs of disease; checking their eyes, ears and teeth and then listening to their heart and lungs with a stethoscope. 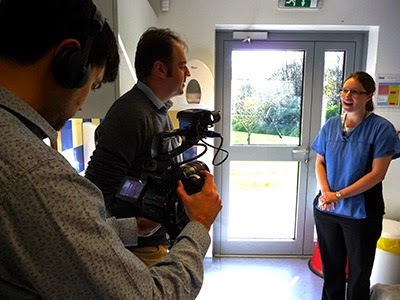 Simon also spoke to Nicky Trevorrow, our Behaviour Manager, who explained how to minimise the stress associated with a visit to the vet – right from the home, throughout the journey and in the waiting room. Nicky gets ready for her close-up! Watch this space for the announcement of Simon’s Cat’s video about the day. The Off to the Vet film will be released in 2015, watch the teaser below. Cats Protection isn’t able to provide veterinary services for the public. However, you might want to consider a home visit for your cat if your own veterinary practice offers it, or look for a cat-friendly clinic, accredited by International Cat Care. For more information, check out the Cats Protection veterinary guide called You and your vet.